The jackfruit tree is native to countries such as India, Bangladesh, Philippines, Thailand and Sri Lanka and maybe even East of Malay. It’s cultivated on Tropical conditions and the Jackfruit is believed to be the largest tree borne fruit in the world. 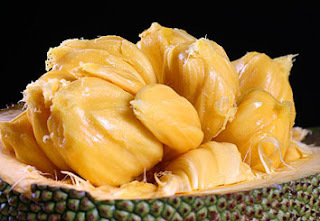 The Scientific name of Jackfruit is Artocarpus heterophyllus and comes from the family of Mulberry family (Moraceae). Native to countries like Sri Lanka, India, Malaysia and Bangladesh it was known to have originated from the Western Ghats of India. It is the National Fruit of Bangladesh and Indonesia. The Jackfruit was introduced to Northern Brazil in the mid 19th Century. It has been a major part of Indian Agriculture for Centuries. It’s believed that the great king Asoka in India encouraged cultivation of the Jackfruit. History shows that cultivation of jackfruit goes back to as much as 5000 to 6000 years. There are many benefits of the Jackfruit tree. It’s a very nutritional and tasty fruit and even the seed of the fruit is edible and very high in nutritional value. The tree yields strong wood when mature and valued for its durable termite proof timber which can be used to build furniture. The leaves are one of the favorite diets of goats in these tropical areas. Jackfruit is very useful when it comes to lowering blood pressure due to its very high level in potassium. The root of the Jackfruit is known to have many curative benefits. Its extracts are used by many native medicine makers to cure fever and diarrhea, it’s also found to be beneficial for asthma patients, and used to treat many skin problems as well. In Addition, the Fruit contains a high amount of Vitamin A, Vitamin C, Calcium, Iron, Sodium, and many more nutrients. It calorie content is very low and is used in diets for weight loss or even to gain weight. The Vitamin C in the Jackfruit helps to increase the body’s immunity system and keep gums healthy. It’s what keeps the cells in the body together. The nutrients in Jackfruit also stops cancer cells from developing within the body, keeps the blood pressure low, fights against ulcers and makes the skin look younger by slowing down the degeneration of cells in the body. There are many varieties of Jackfruit. The sweetest and best is considered as the Honey Jack. The Jackfruit Tree is an enormous tree which is large and bushy found growing mainly in tropical areas which are seen to have Monsoon rains. The young branches contain sticky white latex which can be useful to make birdlime. The leaves of this tree are oval shaped and deep green and glossy and grow in clusters. Its unique male and female flowers are borne in separate flower heads and are mostly seen in February and March. The male flowers are on the new wood above the female flowers. You can tell the difference because the female flowers appear on short twigs from the trunk. Male Flowers has pollen and the female flower doesn’t and another distinctive feature of the female flower is that it begins to swell very soon. 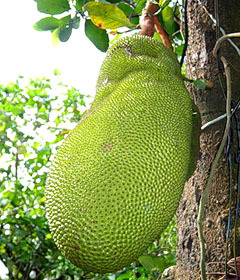 The Jackfruit can become as large as 36 inches long and 20 inches in diameter making it weigh more than 80 pounds. These fruits hang from branches and trunks and sometimes you will also be able to see fruits hanging from the roots of some older trees. These large round or oblong fruit has a rough skin and is usually covered with a thick layer of pointed studs. Due to its very sticky white latex found inside the fruit its best if you dip the knife in vegetable oil before cutting the fruit. 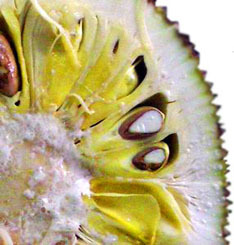 Within the fruit are many carpels which are small yellow pulpy pockets with seeds. This yellow pulp can be consumed raw when ripe and cooked when it’s not. It’s very starchy and fibrous which provides energy and has an abundance of dietary fiber. The seeds are also considered to be very nutritious and is consumed cooked by making curries or even fried, or just by drying and soaked in honey. It’s used as a cuisine in most parts of Asia and is the most popular fruit after mango and banana.